Dovydas Neverauskas (pronounced "DOEvee- duss never-OUS-kiss")...His father, Virmidas, promotes baseball to Lithuanian children and coaches a handful of national, club and Little League teams...Attended the 2008 and 2009 MLB European baseball camps in Italy. Became the first player to be signed directly out of the country of Lithuania after being signed by Pirates scout Tom Randolph in 2009...The only other Lithuanian to play Major League Baseball was outfielder Joe Zapustas, who was raised in Boston and played just two games for the Philadelphia Athletics in 1933. Split season between Pittsburgh and Triple-A Indianapolis...Made the Major League Opening Day roster for the first time in his career...Pitched a scoreless inning in the Season Opener on 3/30 at Detroit, but was then scored upon in five of his next six games (5.2ip/8er) and was optioned to Indianapolis on 4/16...Struck out four batters in 2.0 scoreless innings to earn his first save with Indy on 4/20 vs. Charlotte...Was scored upon just once in 13 Triple-games between 4/20 and 5/26 (18.0ip/2er - 1.00 ERA)...Posted a 1.17 ERA (23.0ip/3er) and two saves in 17 appearances with Indy thru 6/6...Was recalled by Pittsburgh on 6/8 and pitched 2.0 scoreless innings that afternoon at Chicago (NL)...Was scored upon in two of his next three games (2.1ip/5er)...Was optioned to Indianapolis on 6/18... Was recalled on 7/3 and struck out a career-high five batters in 2.0ip that night at Dodger Stadium...Was charged with a season-high four runs in 0.2ip on 7/6 vs. Philadelphia... Was optioned back to Indianapolis on 7/7...Did not allow an earned run in his eight Triple-A appearances during the month of July (11.1ip/1r)...Was selected to the International League mid-season All-Star team...Had a 1.14 ERA (39.1ip/5er) and four saves in 29 games with Indy when he was recalled a third time on 8/3...Made two appearances (2.2ip/1er) before being optioned back to Indianapolis on 8/10...Was recalled a final time by Pittsburgh on 9/1...Posted a 4.22 ERA (10.2ip/5er) in 10 games with the Pirates during the month of September...Was scored upon in 15 of his 25 games with Pittsburgh; 13 of his 25 runs allowed came via a home run...Gave up two hits and posted a 1.13 ERA (8.0ip) in seven outings during the afternoon with the Bucs. Began season with Triple-A Indianapolis, where he led the staff in saves and ranked third among International League leaders...Also had five separate stints in the Majors with the Pirates...Picked up a save in his first appearance on 4/7 vs. Toledo...Produced a 0.00 ERA (8.1ip/3r/0er) in five games thru 4/22...Was recalled by Pittsburgh on 4/24...Made his Major League debut on 4/24 vs. Chicago (NL) and was charged with one run in 2.0ip...Became the first player who was born and raised in Lithuania to appear in a big league game...Was optioned back to Indianapolis in 4/26...Made five straight scoreless outings (5.0ip) between 5/10-19...Had a 3.58 ERA (27.2ip/15r/11er) and four saves in 21 Triple-A games prior to his second recall to Pittsburgh on 6/8...Tossed a scoreless inning on 6/8 vs. Miami and gave up two runs in 2.0ip on 6/9 vs. Miami...Was optioned back to Indianapolis on 6/10...Was scored upon in just three of his 18 appearances with Indy between 6/1 and 8/1 (21.0ip/4er - 1.71 ERA) and went 7-for-8 in save opportunities in that time...Was recalled a third time by Pittsburgh on 8/2 when Wade LeBlanc went on the Bereavement List...Pitched a 1-2-3 ninth inning on 8/3 vs. Cincinnati...Tossed 2.0 scoreless innings and won his first Major League game on 8/6 vs. San Diego...Was optioned to Indianapolis on 8/7...Was recalled a fourth time on 8/19 and pitched a scoreless inning that night vs. St. Louis...Retired the two St. Louis batters he faced while stranding two inherited runners in the game at Bowman Field in Williamsport on 8/20...Made his third straight appearance on 8/21 and suffered first big league loss after giving up a tie-breaking solo homer to Yasiel Puig in the 12th inning of a 6-5 loss...Was optioned to Indianapolis on 8/22... Picked up his team-leading 13th save on 8/26 vs. Columbus... Was recalled a fifth time when Adam Frazier went on the D.L. on 8/28...Had a 2.63 ERA with the Pirates before being scored upon in each of his last two games (1.1ip/4er). Went 4-4 with five saves and a 3.10 ERA (58.0ip/20er) in 47 combined relief appearances between Double-A Altoona and Triple-A Indianapolis...Finished tied for third among all Pirates minor leaguers in appearances...Began season with Altoona, where he posted a 1.50 ERA (24.0ip/2er) in his final 18 outings...Struck out four consecutive batters on 4/19 at Harrisburg in 2.0 innings of work...Earned first Double-A save on 5/11 vs. Trenton...Did not allow a run in 12 consecutive outings from 4/25 to 5/30 (16.2ip)...Recorded his lone win with Altoona on 5/13 at Richmond...Was promoted to Indianapolis on 6/15...Was leading all Eastern League relievers with a .129 batting average against (12-for-93) at the time of his promotion to Triple-A...Recorded first save with Indy on 6/18 at Charlotte...Was charged with an earned run in just two of his first 13 Triple-A outings...Picked up first win with Indianapolis on 7/6 vs. Louisville...Allowed one hit while tossing a scoreless eighth inning for the World Team in the All-Star Futures Game at San Diego on 7/10...Struck out a season-high tying four batters in 2.0 innings on 7/19 vs. Lehigh Valley...Recorded a 0.82 ERA (11.0ip/2r/1er) in nine appearances during the month of July...Surrendered only home run of the season and allowed a season-high tying four runs while suffering the loss on 8/6 vs. Toledo...Was placed on suspended list by the Pirates on 8/30 for the remainder of the season due to an off-field incident. Posted a 2-2 record, a 3.16 ERA (68.1ip/24er), 49 strikeouts and a .227 batting average against in 31 combined appearances (five starts) between the West Virginia Power, Bradenton and West Virginia Black Bears...Began season in the starting rotation with the Power...Earned first win after tossing 5.0 scoreless innings on 4/29 at Hagerstown...Allowed six runs while suffering the loss in fifth and final start on 5/4 at Greensboro...Made each of his final 26 appearances of the season out of the bullpen...Was placed on the disabled list on 5/22 with a right biceps strain...Made one rehab appearance with the West Virginia Black Bears on 6/21...Was returned from rehab and reinstated from the D.L. on 6/27...Recorded first professional save in first game back with the Power on 6/27 vs. Greensboro...Did not allow a run in final eight appearances (16.0ip) while also recording a .158 batting average (9-for-57) with the Power...Was promoted to Bradenton on 8/4 for the remainder of the season...Converted four of his five save opportunities with the Marauders. Established minor league career highs in starts, strikeouts and innings pitched while spending entire season with Single-A West Virginia of the South Atlantic League...Made 26 of his 27 appearances as a member of the starting rotation...Finished tied for fourth in the South Atlantic League in starts...Improved to 3-1 after tossing 5.0 scoreless innings in his outing on 5/18 vs. Delmarva...Tossed a 5.0-inning complete game while suffering the loss on 6/3 vs. Kannapolis...Went 0-5 over a stretch of six starts from 5/24 to 6/23 before earning the win on 6/28 vs. Lakewood...Struck out a career-high eight batters while recording his final win on 8/15 at Lexington...Made final appearance of the season in relief on 9/1 vs. Asheville. Worked exclusively as a starter for the first time in his career while spending entire season with Jamestown...Started and lost Game Two against State College in the first round of the New York-Penn League playoffs. Spent majority of season with the Gulf Coast League Pirates before receiving a late-season promotion to State College...Earned his lone win with the Baby Bucs after making his only appearance in relief on 8/18 vs. the GCL Tigers...Made one start with State College after being promoted on 9/1. Spent entire season with the GCL Pirates...Went 3-0 with a 1.53 ERA (17.2ip/3er) in his eight relief appearances and 0-1 with a 7.36 ERA (7.1ip/6er) in his two starts. Spent first professional season with the GCL Pirates...Made professional debut on 6/22 vs. the GCL Yankees and allowed two runs in 2.1 innings of relief...Earned first professional win in final appearance on 7/30 with 2.0 scoreless innings of relief. April 19, 2019 Dovydas Neverauskas assigned to Indianapolis Indians from Pittsburgh Pirates. April 16, 2019 Pittsburgh Pirates optioned RHP Dovydas Neverauskas to Indianapolis Indians. April 13, 2019 Pittsburgh Pirates sent RHP Dovydas Neverauskas on a rehab assignment to Indianapolis Indians. 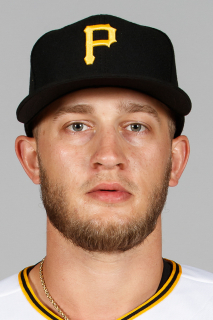 April 7, 2019 Pittsburgh Pirates sent RHP Dovydas Neverauskas on a rehab assignment to Bradenton Marauders. March 28, 2019 Dovydas Neverauskas roster status changed by Pittsburgh Pirates. September 1, 2018 Pittsburgh Pirates recalled RHP Dovydas Neverauskas from Indianapolis Indians. August 10, 2018 Pittsburgh Pirates optioned RHP Dovydas Neverauskas to Indianapolis Indians. August 3, 2018 Pittsburgh Pirates recalled Dovydas Neverauskas from Indianapolis Indians. July 7, 2018 Pittsburgh Pirates optioned RHP Dovydas Neverauskas to Indianapolis Indians. July 3, 2018 Pittsburgh Pirates recalled Dovydas Neverauskas from Indianapolis Indians. June 18, 2018 Pittsburgh Pirates optioned RHP Dovydas Neverauskas to Indianapolis Indians. June 8, 2018 Pittsburgh Pirates recalled Dovydas Neverauskas from Indianapolis Indians. April 16, 2018 Pittsburgh Pirates optioned RHP Dovydas Neverauskas to Indianapolis Indians. August 28, 2017 Pittsburgh Pirates recalled Dovydas Neverauskas from Indianapolis Indians. August 22, 2017 Pittsburgh Pirates optioned RHP Dovydas Neverauskas to Indianapolis Indians. August 19, 2017 Pittsburgh Pirates recalled Dovydas Neverauskas from Indianapolis Indians. August 7, 2017 Pittsburgh Pirates optioned RHP Dovydas Neverauskas to Indianapolis Indians. August 2, 2017 Pittsburgh Pirates recalled Dovydas Neverauskas from Indianapolis Indians. June 10, 2017 Pittsburgh Pirates optioned RHP Dovydas Neverauskas to Indianapolis Indians. June 8, 2017 Pittsburgh Pirates recalled Dovydas Neverauskas from Indianapolis Indians. April 26, 2017 Pittsburgh Pirates optioned RHP Dovydas Neverauskas to Indianapolis Indians. April 24, 2017 Pittsburgh Pirates recalled Dovydas Neverauskas from Indianapolis Indians. March 17, 2017 Pittsburgh Pirates optioned RHP Dovydas Neverauskas to Indianapolis Indians. November 5, 2016 Pittsburgh Pirates selected the contract of Dovydas Neverauskas from Indianapolis Indians. September 23, 2016 Indianapolis Indians activated RHP Dovydas Neverauskas. August 30, 2016 RHP Dovydas Neverauskas roster status changed by Indianapolis Indians. June 15, 2016 RHP Dovydas Neverauskas assigned to Indianapolis Indians from Altoona Curve. April 4, 2016 RHP Dovydas Neverauskas assigned to Altoona Curve from Bradenton Marauders. March 4, 2016 RHP Dovydas Neverauskas assigned to Pittsburgh Pirates. August 4, 2015 RHP Dovydas Neverauskas assigned to Bradenton Marauders from West Virginia Power. June 27, 2015 RHP Dovydas Neverauskas assigned to West Virginia Power from West Virginia Black Bears. June 19, 2015 RHP Dovydas Neverauskas assigned to West Virginia Black Bears from West Virginia Power. May 26, 2015 West Virginia Power placed RHP Dovydas Neverauskas on the 7-day disabled list retroactive to May 22, 2015. April 2, 2014 RHP Dovydas Neverauskas assigned to West Virginia Power from Jamestown Jammers. September 1, 2012 RHP Dovydas Neverauskas assigned to State College Spikes from GCL Pirates. July 16, 2011 Dovydas Neverauskas assigned to GCL Pirates from State College Spikes. April 20, 2011 Dovydas Neverauskas assigned to GCL Pirates from State College Spikes. April 20, 2011 Dovydas Neverauskas roster status changed by State College Spikes. September 23, 2010 State College Spikes activated RHP Dovydas Neverauskas from the temporarily inactive list. August 9, 2010 RHP Dovydas Neverauskas assigned to State College Spikes from GCL Pirates. June 21, 2010 Dovydas Neverauskas assigned to GCL Pirates from Pittsburgh Pirates. June 20, 2010 Pittsburgh Pirates signed RHP Dovydas Neverauskas.